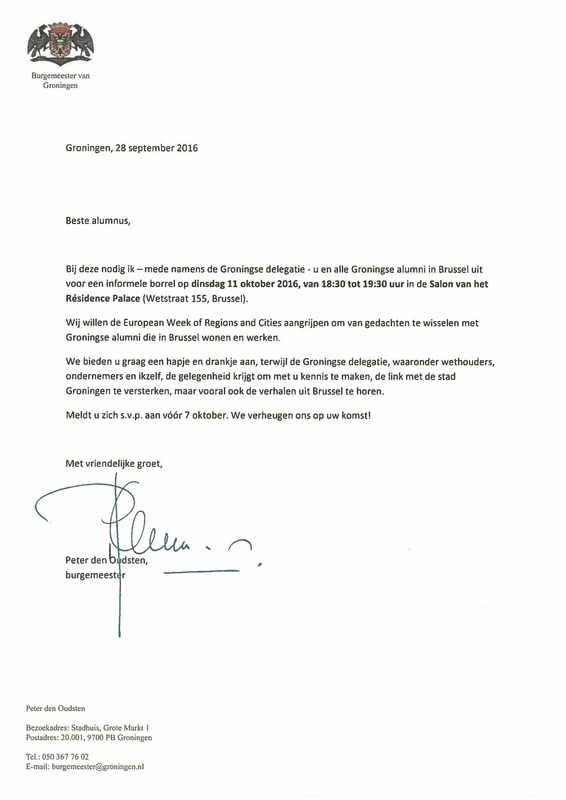 It is our pleasure to invite Groningen alumni to the third UG alumni gathering in Brussels on behalf of Peter den Oudsten, Mayor of Groningen. The meeting will take place on Tuesday October 11th, 18:30h-19:30h in the Résidence Palace, Brussels. It will be an informal evening that will provide an opportunity to meet the Mayor and other Groningen delegates and to share your thoughts on strengthening the relation between Brussels and Groningen. Please find the official invite by the Mayor below (NB: in Dutch) and make sure to register for this meeting via the green registration button.